Hurtigruten Norway Coastal 7 Day Classic Voyage North. The Hurtigruten 7 day Classic Voyage North is very popular among travellers who may not have time for the full round voyage, but wish to enjoy watching the gradual transitions from the populated, lush southern regions of the coastline to the more sparse landscapes north of the Arctic Circle. 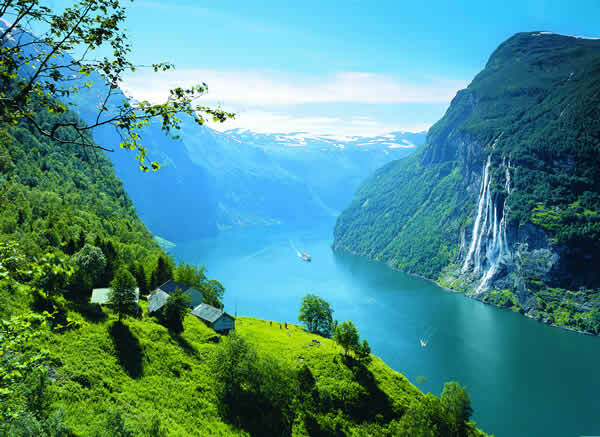 Joining the Hurtigruten ship in Bergen, you embark on the classic journey that will take you from the lush green south to the wild and remote north. The coastal voyage spends seven days and six nights travelling north and calls at a total of 34 ports from Bergen in the south to Kirkenes in the north. Every day offers a new highlight such as the Art Nouveau town of Ålesund, medieval Trondheim and the visually awesome UNESCO World Heritage Site of Geirangerfjord. Disembarking in Kirkenes you have the opportunity to extend your trip in northern Norway to Finland or Russia, before catching your flight south to Oslo. During the night the ship navigates the narrow Raftsund strait. After a stop in Harstad, situated on the largest island of Norway, Hinnøya, you continue via Finnsnes to Tromsø for a prolonged stay. Many of the epic Arctic expeditions used Tromsø as a starting point; the famous explorer Roald Amundsen sourced both crew and supplies here. The vistas become more dramatic as your Hurtigruten ship approaches the finale of the northbound voyage here in the far reaches of Europe. Benefiting from the warm currents of the Gulf Stream, this region is rich in sea life, and the coast is largely ice free in winter allowing ships access to most harbours. Soon you reach Kirkenes, from where the emotive border with Russia a few kilometres away or the Sami communities of Northern Finland may be visited. And at longitude 30 east, you are actually further east than Istanbul and St. Petersburg. Here you bid farewell to your fellow passengers, the ship and crew. Transfer to the airport or your hotel if you have booked an optional night in Kirkenes.